The Capital Region's coolest Realtor! Born and raised in New York’s Capital Region, Colin McDonald’s familiarity with the area spans over 32 years. After graduating in 2007 from the University of New York at Albany with a B.A. in Communications and minor in Business Management & Marketing, he migrated 150 miles south to New York City to pursue a career in Public Relations. One accomplishment he is most proud of is concept development of a national marketing campaign while working for an international retail brand. 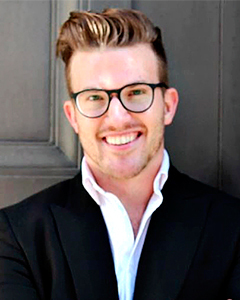 In late 2012, Colin expanded his efforts to entrepreneurship by starting a niche marketing consulting firm, The Colin T. McDonald Agency (CTMA). While a free agent, he continued to broaden his creative efforts by implementing innovative ways to elevate his clients' brands, all while becoming versed in other facets of business or trade. Colin has the desirable skills of developing professional client relationships and networking. From his earliest memories, Colin’s been involved in real estate in some form or another. In April of 2015, he launched into real estate sales marketing a team of top brokers in the Bethlehem area. That year, they closed just shy of 30 million in listings. Currently, Colin is a Licensed Associate Broker with Berkshire Hathaway HomeServices in Delmar, NY. He is also a go-to commentator and host for Realtor.com. Colin believes in innovation to be ahead of the curve, and encourages those he works with to do the same. His unique ideas paired with unparalleled creativity are what set him apart from your average agent. In addition, Colin has a strong compassion to “give back” to those in need. He donates his time to local and national charities such as Make-A-Wish Foundation, Bob Woodruff Foundation, Renewal Care Partners, Albany Damien Center, Equinox, The Children’s Hospital, and Trinity Alliance.